Relief is on its way for the bug-addled reaches of Fallout: New Vegas, but players will need to hold out for a few more weeks. Saying that Fallout: New Vegas has a few bugs and glitches in it is about the same level of understatement as saying the ocean is a little damp. The glitches range from fairly trivial concerns like enemies getting stuck in walls, to more severe and aggravating bugs, like the game corrupting save files. There's no immediate relief in sight, but Bethesda says that it is working on getting these issues resolved. 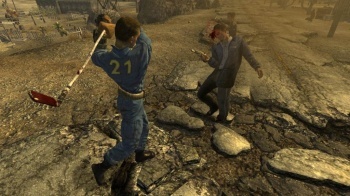 Writing on its official blog, Bethesda says that it is working on a "comprehensive" patch for the Xbox 360, PC, and PS3. The patch will fix a number of problems, including the issue on the Xbox 360 where would eat player's saves. The patch is apparently in the final stages of testing and certification, meaning that it should be available in the next few weeks. In the meantime, Bethesda will release a patch for the PC version of New Vegas which should solve problems with companions and save game corruption, as well as improving performance with NVIDIA users and resolving issues with the game's physics engine. This patch should be available by early next week. Obsidian, the developer behind New Vegas, made the case that the reason the game has so many bugs is because it is so big, which makes sense, but still doesn't really excuse the sorry state the game was in when it was shoved out the door. There's a difference between missing a few bugs and missing the dozens of problems that New Vegas shipped with.